Eureka Entertainment have announced that they will be releasing two films starring Jean-Claude Brialy and Gérard Blain by the master director of the French thriller, Claude Chabrol – his debut feature, Le Beau Serge [Handsome Serge], the first feature film of the French New Wave, and the breakthrough feature and first massive commercial success, Les Cousins [The Cousins], winner of the Golden Bear (Best Film) at the 1959 Berlin Film Festival. Both titles have been painstakingly restored by Gaumont for these new HD restorations and will be released on DVD & Blu-ray on the 25th March 2013. These editions will include documentary extras, shorts, and lengthy booklets packed with writing about the film and interviews with Chabrol. Gérard Blain and Jean-Claude Brialy star in the first of their collaborations with the great Claude Chabrol. The director's masterful feature debut – ironic, funny, unsparing – is a revelation: another of that rare breed of film where the dusty formula might be used in full sincerity: Le Beau Serge marks the beginning of "the Chabrol touch." In this first feature film of the French New Wave, one year before Truffaut's The Four Hundred Blows, the dandyish François (Brialy, of Godard's A Woman Is a Woman, Rohmer's Claire's Knee, and countless other cornerstones of 20th-century French cinema) takes a holiday from the city to his home village of Sardent, where he reconnects with his old chum Serge (Blain), now a besotted and hopeless alcoholic, and sly duplicitous carnal Marie (Bernadette Lafont). A grave triangle forms, and a tragic slide ensues. From Le Beau Serge onward up to his final film Bellamy in 2009, the revered Chabrol would come to leave a significant and lasting impression upon the French cinema – frequently with great commercial success. 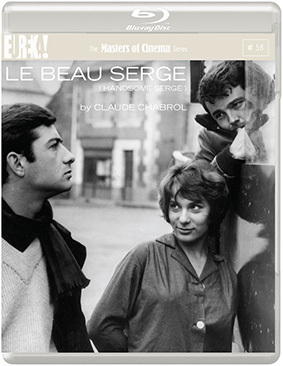 Le Beau Serge will be released on Blu-ray and DVD in the UK for the first time on 25th March 2013 by Eureka as part of the Masters of Cinema Series at the RRP of £20.42 for the Blu-ray and £18.37 for the DVD. In Les Cousins, Blain's character journeys from the country to Paris to crash at the luxurious flat of his worldly and decadent cousin, portrayed by Brialy, during the study period for an upcoming law exam which both have set out to undertake. It becomes clear soon enough that only one of the cousins is terribly committed to his work; as sexual promises and alcohol intervene, the set-up becomes untenable for the provincial, – and a tragic slide ensues. A gripping and urbane examination of city and country, ambition and ease, Les Cousins continues to captivate and shock audiences with its brilliant scenario, the performances of Brialy and Blain, and the assuredness of Chabrol's precocious directorial hand. 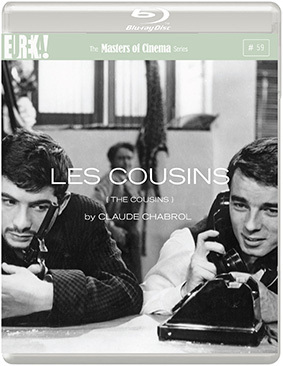 Les Cousins will be released on Blu-ray and DVD in the UK for the first time on 25th March 2013 by Eureka as part of the Masters of Cinema Series at the RRP of £20.42 for the Blu-ray and £18.37 for the DVD. A lengthy booklet with a new and exclusive essay by critic Emmanuel Burdeau; a new and exclusive translation of a rare text about actress Françoise Vatel provided for this release by its author, the filmmaker and critic Luc Moullet; excerpts of interviews and writing by Chabrol; and more.